Triples the duration, but adds a cast time. The glowing effects on the wrists signify the effect is in use. Accelerate: Cost: [3780 / 3690 / 3600 / 3510] Magicka. Channeled Acceleration: Casting Time: 1.3 seconds, Cost: [3510 / 3420 / 3330 / 3240] Magicka. 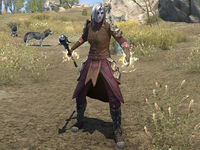 Race Against Time: Cost: [3510 / 3420 / 3330 / 3240] Magicka. Accelerate (also known as Acceleration) increases your Movement Speed and critical damage dealt for a short time. Channeled Acceleration increases the duration at the cost of a short channeling delay, while Race Against Time also reduces the cost of sprinting for the duration.